As we gear up for whatever public relations challenges we face in 2017, it seemed a good time to make sure we “do this and not that” when it comes to strategic communications. The old notion that any PR is good PR does not apply in today’s climate, if it ever did; a public mistake will sully a reputation quicker than you can say negative virality. So, as the new year approaches, here are our rules for advice to avoid. Don’t be too prepared for that CEO interview. One chief executive told us that a PR consultant recommended “winging it” for an important media interview, lest he sound too scripted. We’d like to politely disagree. For our client interviews, we prepare briefing docs, hold a prep session and practice interviews until a level of level is achieved. And, we do it again for every interview since different journalists have different interview styles and subject matter shifts all the time. Don’t believe that you can be too prepared, particularly in the case of a live on-camera interview. Every new product introduction needs its own media event. With media outlets cutting staff and a plethora of press parties competing for attendees, events just don’t have the pull that they used to. Though media events for truly innovative launches or with a captive press audience (at a conference like CES) can work, they are often overly expensive and bloated affairs that don’t deliver on expectations. We find a combination of judicious use of media exclusives, in-person or Skype product demos and informed and well-prepared spokespeople can often achieve better results more cost-effectively. The best way to measure PR is by the number of interviews secured. Quantity over quality? We don’t think so. Judging a team’s performance solely by how many interviews they can arrange for an announcement is a poor way to determine effectiveness. PR goal-setting should start from a more strategic place. Typically clients should be asking who is our target customer and what media do they consume. For some B2B clients, a story in a highly targeted trade journal is much more effective than coverage in top dailies. Overall the best PR partnerships include joint goal-setting for media relations and reviewing on a regular basis. It’s OK to fudge the truth to get your foot in [the media’s] door. This is a doomed strategy on so many levels. To begin with, nothing ruins credibility with media quicker than telling them something that is proven untrue. A company associated with a lie also faces a nearly impossible climb back to media (and public) trustworthiness. The better strategy is to hold reasoned discussions with a client to determine what the real news is, and if the company has nothing earth-shattering to work with, it’s our job to create currency with a survey or point of view that’s full of good facts and figures the media can use. You can do your own PR! The best PR campaigns come from a combination of great understanding of client messaging, keen knowledge of media needs, and a flair for packaging a story and making it timely. It’s a complicated skill set, which we’ve written about before, that requires experience and finesse and the work is typically not something you “want to try at home.” Sure, the occasional amateur outreach can touch a reporter and result in a positive story. But more likely than not, it will result in abject silence, or worse, backfire into something negative or unexpected. Our best advice? 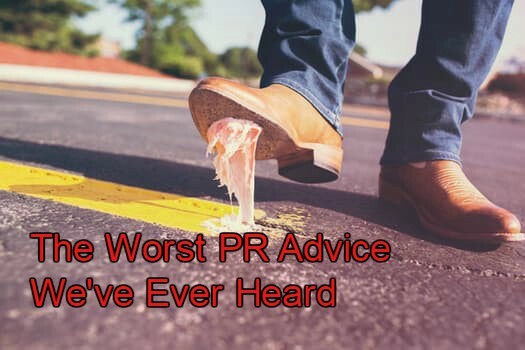 Leave the PR work to the professionals.